We all have our favourite sleeping positions, but some may be doing more harm than good. People are find it difficult to get comfortable and have a good quality sleep, will toss and turning into weird and wonderful positions! More patients have been coming to see me in the last few weeks with pain they have woken up with, or they're not quite sure how it started through the day. Very often this is caused by the way they have slept. 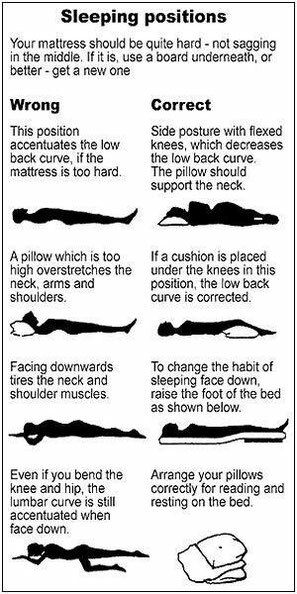 This image illustrates some of the most aggravating positions that we can sleep in (front being the worst), and some options if you have back pain to keep you comfortable. This image shows how the spine and pelvis position can be distorted without the appropriate support or positioning. 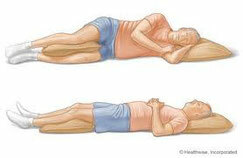 This illustration demonstrates how an incorrectly placed pillow can stress the neck.